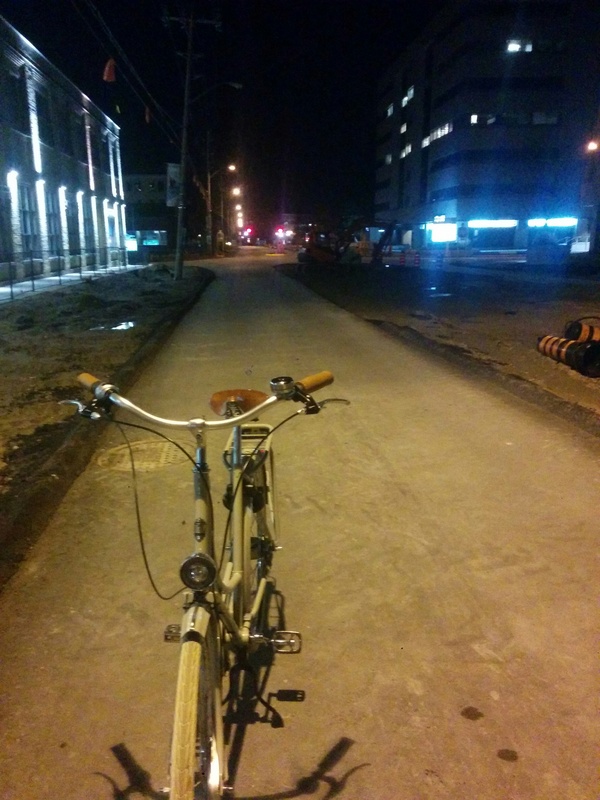 I got my first taste of the new King Street between William and Union. It’s going to be culture shock for drivers, from 4 lanes to 2 narrow ones and multiple 4 way stop signs. Yet still zero cycling infrastructure. I’m guessing the final implementation will also have zero cycling infrastructure. Riding the narrow lanes last night, my impression was that there’s not enough room for a cyclist to ride a meter from the curb and be passed by a car with a metre of space. You know what that means? ‘Take the Lane’ baby. The lack of cycling infrastructure is really disappointing. I have no problem taking the lane and feel totally comfortable doing so. As a relative newcomer to the area, unfortunately, from what I’ve seen, I suspect what it will really mean for most people is “Ride the sidewalk, baby.” Sigh. Perhaps there’s hope that when fully developed it will feel more like the domain of peds and transit rather than that of cars, the space making the auto feel more the exception than the rule… and making cyclists feel more safe and comfortable controlling the lane. Perhaps. One can dream, right? Perhaps the saddest part is that where the LRT tracks end on King Street, completely segregated bike lanes have been approved by city council slated for construction 2017ish …. Road design up to that point is by the Region of Waterloo / Grand Linq (consortium building the light rail). Hi I’m new in the region and live in downtown Kitchener. Here it seems that King st. is single file between bikes and cars. Although I seem to be one of the only ones doing it, it worked nicely and cars didn’t pass me. Does King st. in uptown have such indication? Does anyone know how it came to be in Kitchener and if it would be possible to have that in Waterloo as well?